Eastern and Central European countries, de factoincluding Ukraine, look forward to Chinese investment. At the same time, Western Europe sees China's financial injections as a potential threat to EU integrity. Following the third meeting of the Ukrainian-Chinese Cooperation Commission in Kyiv on 5 December, the sides signed, among other things, the Ukraine-China action plan on the implementation of the initiative to build the 21st Century Silk Road Economic Belt and Maritime Silk Road. 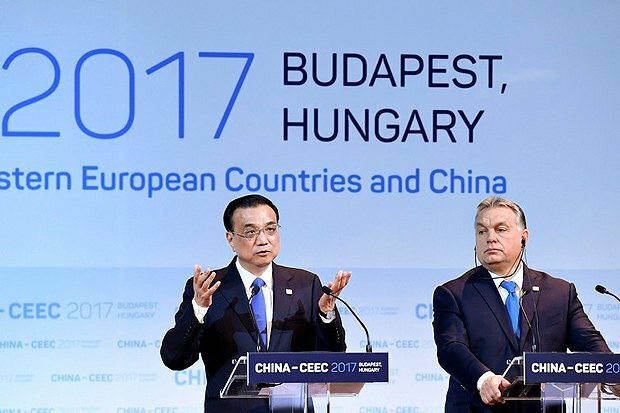 A week ago, Budapest hosted the 6th annual summit of cooperation between China and the countries of Central and Eastern Europe (CEE) in the 16+1 format. Its participants included the prime ministers of member countries (China, Bulgaria, the Czech Republic, Croatia, Hungary, Estonia, Latvia, Lithuania, Poland, Romania, Slovakia, Slovenia, Bosnia and Herzegovina, Macedonia, Serbia, Montenegro and Albania), as well as observers from Austria, Belarus, Greece, Switzerland, the EBRD and the EU. In addition to solid financial injections into the projects (Chinese Prime Minister Li Keqiang announced plans to invest 3bn dollars), the Chinese take control of the key facilities in the region such as railways, ports and power plants. 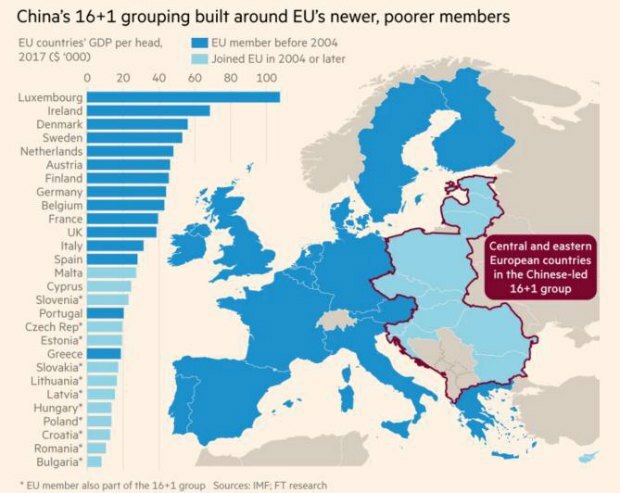 Poorer European states deserve "special attention"
Initiating the 16+1 format in 2012 before the "One Belt, One Way" initiative, China hoped (and managed) to build a new platform for cooperation with the EU. Beijing paid particular attention to CEE, which is economically less developed than Western Europe. The reason is absolutely simple: Chinese investments will be more needed where there is a demand for external financing of projects, modernization or creation of new enterprises and infrastructure. After in 2013 the head of the People's Republic of China, Xi Jinping, came up with the global initiative "One Belt, One Way", which became the core of China's foreign policy, the 16+1 format took on new meaning - this region is a "gateway" for Chinese goods on their way to European markets. Holding the 6th Budapest summit, the Chinese focused on expanding political and economic ties with countries of the region. They want to expand their economic presence in trade, investment, transport, infrastructure, industry, energy, modern technologies, finance and agriculture. Therefore, the final document - the Budapest Guidelines for Cooperation – contains a plan of activities for the next year at the level of the relevant ministries in all these areas. For the first time, for deeper integration, it offers a mechanism of exchange of officials between the governments of China and European countries, as well as the creation of a committee on cooperation in commercial law under the Business Council of China and CEE. This will allow both parties to better understand not only the specifics of business processes but also the mechanisms of public administration. The Interbank Association of China and CEE countries will make financing of projects easier. The association will have 2bn at its disposal. Traditionally, the Chinese leadership pays special attention to cultural exchanges as an element of soft power. In particular, this year the Coordination Centre for Cultural Cooperation between China and CEE was set up in Macedonia to oversee joint activities in culture, cooperation among universities and etc. The Chinese leadership considers railways an important link in the delivery of goods to European markets. For this purpose, they plan to combine the "One Belt, One Way" initiative with the Trans-European Transport Network (the project for the creation of auto, rail, air and water transport links) and extend it to Western Balkans. Thus, a new impetus was given to the construction of the Belgrade-Budapest railway, for which a joint Chinese-Serbian-Hungarian working group will be established. The total length of the route is 350 km, of which 160 km run through Hungary. The capacity of the Belgrade-Budapest railway line will be expanded with the ports of Montenegro and Albania. In 2016, the Chinese company COSCO bought the Greek port of Piraeus, and, obviously, there are plans to take control of other European ports. Also, the Chinese plan to build a network of new logistic centres for the development of container train services to CEE countries. High-speed line: "Budapest - yes! Kazan - no!" While actively financing European infrastructure projects, China's investment in Russian facilities stumble upon significant difficulties. For example, the expediency of the Eurasian high-speed transport corridor Moscow-Beijing, which was announced in 2014 and whose first segment was expected to connect Moscow and Kazan with a high-speed railway line, is in question. The total cost of the project was estimated at 245bn dollars. It costs about 15.6bn dollars to build a 770-km-long Moscow-Kazan section. In 2014, China said that it was ready to provide its technology and build the railway line in exchange for energy supplies from Russia, but the process has not moved on. In 2016, China reaffirmed its readiness to invest, transferring 52bn roubles into the joint-stock capital of the first phase of the project, 1bn dollars into the second phase, and 400bn roubles as a loan from China Development Bank. The first train was expected to be launched by 2020, but in November this year, Russian Railways President Oleg Belozerov announced a postponement until 2022-2023. The deadline for the construction of the entire Moscow-Beijing line is 2035. Most experts are very sceptical that this project can be accomplished. First, a pre-feasibility study is very vague about a chance to recover 245bm dollars of the investment (not to mention its source). Even 15.6bn dollars, for which they want to build the Moscow-Kazan section, look like a low-end estimate, and Chinese financing so far exists only on paper in the form of memorandums of understanding. 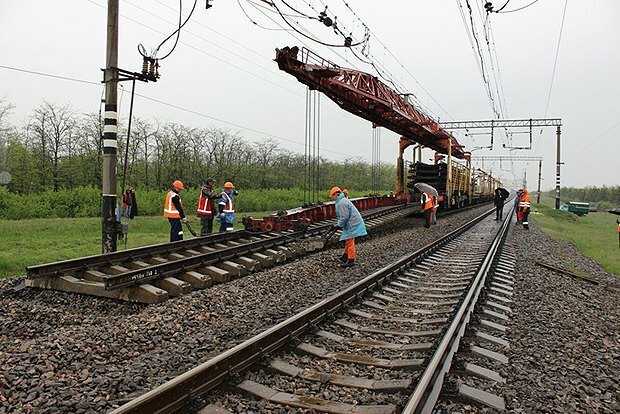 Therefore, a meeting in September chaired by Russian Deputy Prime Minister Arkadiy Dvorkovich discussed an option of having the Moscow-Vladimir section built first, followed by an assessment of demand and only then an extension to Kazan. Second, Russian Railways completed the design of the Moscow-Kazan section in September 2017 only, but questions remained to what extent Chinese technologies should be used (there are security issues and concerns about Russian production capacity to build the necessary infrastructure and rolling stock even for a railway track gauge of 1,520 mm). Third, the world has seen on more than one occasion failed experiments to use high-speed lines for freight transport (for example, TGV La Poste). There are several reasons for this: cargo trains require more durable lines, bigger turning radii, and, finally, infrastructure for loading and unloading cars. Fourth, it is profitable for Russia for the Beijing-Berlin railway line to have many stops on the way, but the volume of trade between the regions does not require ultra-fast transport of a large number of goods, while each additional stop increases power consumption by trains. Finally, the cost-effectiveness of the project remains questionable. More than 300,000 TEUs (a 20-foot equivalent unit – ed.) are expected to transit through Russia in 2017, while there is enough capacity to increase cargo traffic 4-5 times up to a million TEUs. The existing product range carried by freight trains does not require such an acceleration of delivery as a high-speed line can provide, and perishable goods from China are delivered by air. Therefore, it is unclear how freight cars can be loaded. The same is true for passenger cars because it takes 600 euros and nine hours to fly from Berlin to Beijing (12 hours by Aeroflot with a stop in Moscow). It is noteworthy that Russian media provided little or critical coverage of the 16+1 summit because China's bigger presence in CEE would mean Russian influence was decreasing. In this regard, it is noteworthy that China has reacted positively to the "initiative of the three seas" and even included it in the Budapest Guidelines for Cooperation. This initiative proposed by the countries on the Black, Adriatic and Baltic seas provides for closer cooperation in economy, energy and infrastructure. 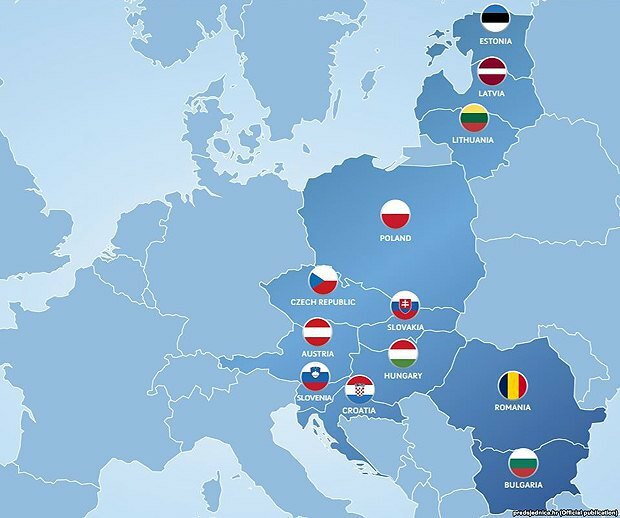 At the summit in Warsaw in 2017, the participating states (Poland, Lithuania, Latvia, Estonia, the Czech Republic, Slovakia, Slovenia, Hungary, Romania, Bulgaria and Austria) discussed ways to advance energy independence from Russia. The construction of gas interconnectors is expected to reduce dependence on Russian gas. Apart from the United States, this association evoked interest from China: representatives of the Chinese Foreign Ministry considered this project fully compatible with the concept of "cooperation in the three port zones". Why do some Western European countries not trust Russia? The scope of China's operations in the region has spilled over into overtly political and strategic areas, breeding mistrust among some of the western European powers, according to the Financial Times. "This subregional approach [16+1] is meeting a great deal of suspicion not only in Brussels but also in the capitals of many member states," a European diplomat who declined to be identified told FT. The website suggested that with the time economic dependence on China will lead to a political one, and Beijing's closer ties with the EU's poorer nations will influence the bloc's policies and could be exploited to undermine union rules. There are two main concerns about China. The first is that China may use close ties with CEE to undermine the bloc's overall policy. The second is that some 16+1 countries may exploit strong ties with China to buttress negotiating positions against Brussels. According to some economists, one concern is that China's push for guaranteed contracts for its companies will undermine the EU's single market rules on public procurement. The issue is particularly relevant as Brussels pushes to implement a vetting process for inward investments against resolute opposition from Beijing, which has pumped record amounts of money into Europe in recent years. In September, German Vice-Chancellor and Foreign Minister Sigmar Gabriel called on Beijing to respect the concept of "one Europe" adding: "If we do not succeed for example in developing a single strategy towards China, then China will succeed in dividing Europe." The Chinese Foreign Ministry declared itself "shocked" by Gabriel's statement, "since China has always firmly supported EU integration in the most stable, firm and unconditional manner, whether privately or publicly". Li Keqiang tried to dispel the suspicion. He stressed during the summit that cooperation in the 16+1 format is not a geopolitical tool, but rather an "incubator" of practical, trans-regional cooperation that promotes a balanced development of relations between China and the EU. Photo: Some EU diplomats are concerned that China may seek CEE support for its position on important political issues. Some European diplomats are also concerned that China may seek support for its position on important political issues such as the disputed South China Sea, countering the Dalai Lama, and promoting the one-China policy. 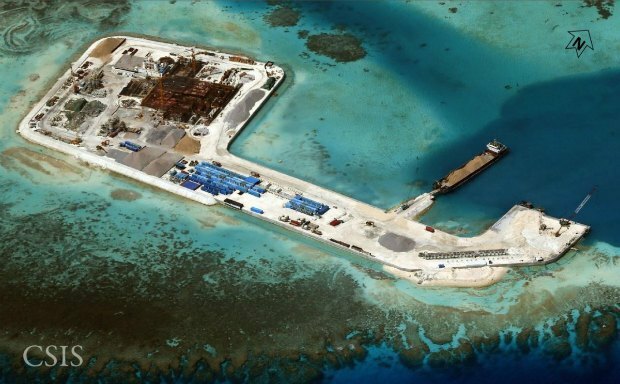 The potential fruits of Beijing's influence became clear last year when the EU debated how to respond to an international court ruling that China's claims to maritime rights and resources in the South China Sea were incompatible with international law. According to European diplomats, after three days of difficult talks among the EU's 28 members, opposition - primarily from Hungary and Greece – succeeded in weakening the statement to the extent that it did not directly mention China. There were also questions about Chinese investment projects: this year the European Commission carried out an investigation into the already mentioned Belgrade-Budapest railway, and in Macedonia, the Transport Ministry has blocked the completion of a China-financed 57-km highway. On the other hand, some analysts admit that the friction about the 16+1 reflects wider tension within the EU, especially between the eastern and western member states. "We should expect China to leverage the 16+1 to pursue its own interests in the EU'," said Jonathan Hillman, director of the Reconnecting Asia Project at the US Centre for Strategic and International Studies. "That is strategic diplomacy: building relations where you have more leverage and applying those new relationships where you have less leverage. If China is winning friends, why wouldn't it also influence people?" Will Ukraine and China reset relations? Ukraine does not participate in the 16+1 initiative, being de facto an Eastern European state and having a free trade zone with the EU. Experts have repeatedly mentioned the need to establish closer political and economic ties with Beijing, however official Kyiv has not developed a clear and unambiguous position on relations with China yet. After the association and free-trade agreements with the EU were signed, many suggested China may establish companies in Ukraine to deliver goods to European markets, but, in fact, Chinese companies are in no hurry to invest in production in Ukraine. Analysts mention such reasons as political and economic instability, corruption, the conflict in eastern Ukraine and negative experience with Chinese investments. There is a hope that "relations were repaired" in earnest during the third meeting of the Commission on Cooperation between the Governments of Ukraine and China, which was held on 5 December this year. As a result of the meeting, they announced plans to "expand, deepen and step up" ties, traditionally limiting details to a list of key areas: infrastructure, manufacturing and agriculture. After a meeting with Ukrainian Prime Minister Volodymyr Groysman, Chinese Deputy Prime Minister Ma Kai welcomed Ukraine's wish to play an active part in the implementation of international projects. "We suggest that we intensify our cooperation on the international project 'One Belt, One Way' and in this context, we view Ukraine as one of the logistics and industrial centres on the way to the European Union, and we also hope to resume work on our joint infrastructure projects," the Chinese official said. At the same time, the head of the Chinese delegation, Deputy Prime Minister Ma Kai, announced that the potential overall package of cooperation between Ukraine and China envisages the implementation of joint projects totalling about 7bn dollars. Here the key word is successful, because have been a number of Ukrainian-Chinese contracts which failed due to our fault. "Two key vectors in economic cooperation between Ukraine and China are mutually beneficial trade and investment," says Olha Khomenko, an expert of economic programmes at the Ukrainian Institute of the Future. In her opinion, one of the tools to boost trade is to sign a free-trade agreement. China's ambassador to Ukraine, Du Wei, mentioned this possibility last year. "According to Ukrstat's data for the third quarter, there is a tendency towards an increase in Chinese imports while exports are shrinking compared with 2016, making not more than 3.9% of total exports. A free-trade agreement offers more opportunities for national exporters and Chinese importers. In particular, Ukraine may increase exports of finished products (agribusiness, woodworking and metallurgy), as well as intellectual services - IT, consulting and aircraft engineering. For Chinese manufacturers, Ukraine is a connecting link between Asia and the EU, which gives access to the European market. However, a free-trade area also carries risks: Ukraine's role can be reduced to a "small bridge" between the EU and China; building up only raw materials exports to China will not facilitate Ukraine's transition to an innovative stage of development; the growth of imports of cheap products will tighten competition on the domestic market of Ukraine," the expert said.